This is the second time I have been lucky enough to taste through a range of wines from Emilia-Romagna, the northern Italian province sandwiched between Tuscany to the south and Piedmont to the north. Despite its illustrious neighbours, the wines of Emilia-Romagna are nowhere near as famous and are rarely seen on UK shelves. Yet this tasting, like my previous one in 2004, suggests quality is high and prices moderate. Wine-wise, Emilia-Romagna’s only worldwide claim to fame is with Lambrusco. Whilst some high quality Lambrusco is produced alongside the sea of fizzy, sweet wine that has become the most famous – perhaps infamous – name of the region, it is not featured in this report. The truth is that Emilia-Romagna is famed much more for its other two great gastronomic products: Parmesan cheese, and Parma Ham. But whilst the world continues to beat down doors to get the very highest quality in both, the wines of Emilia-Romagna have been improving quietly and steadily. 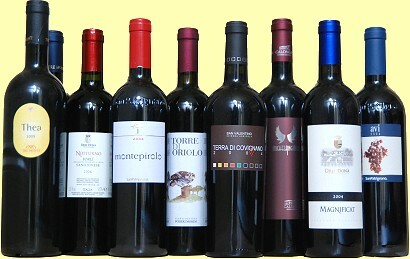 The DOC reds are based largely on Sangiovese as in Tuscany, with a growing number of IGT wines made from Cabernet Sauvignon, Merlot and Cabernet Franc. Also featured in this report are a couple of wines from regions close to the popular seaside town of Rimini. This report concentrates on the DOC wines of Sangiovese di Romagna and Sangiovese di Romagna Superiore, and a selection of IGT wines from the same producers. The wines featured here were sent to me by the Convito di Romagna, an association of eight quality estates formed to give greater visibility to the hillside vineyards of Romagna and the Sangiovese grape. Few are available in the UK, but according to wine-searcher.com there are over 100 Emilia-Romagna wines listed with UK stockists, including some other cuvées from producers featured here. This collection of 18 bottles was very impressive. The first wine I can remember having tasted from the D.O.C. Colli d’Imola, which was created in 1997 in an area most famous for producing another Italian product: Ferrari sports cars. There is a huge richness on the nose of this 15% ABV white wine, made from varieties that include Petit Manseng apparently. Honey, beeswax, wild flowers and nuts are all in the mix, as well as spices and a hint of exotic, nectarine fruit. Very rich, full-textured and powerful on the palate too, this is savoury, chewy and dense, with a robust core of white fruit and concentrated nutty and herbal nuances coming through. Long and rounding out with some creamy quality in the finish, this is conceived on a grand scale, but is undoubtedly a profound white wine that needs food. Around 3,000 bottles produced. 92/100. Around 20 Euros. A new DOC for me, the Colli di Rimini, this is a ‘Bordeaux blend’ of 85% Cabernet Sauvignon with Merlot and Cabernet Franc matured in Alliers, Tronçais and Nevers oak for one year. It has a sumptuous nose, filled with dense, creamy, supple black fruit and underpinned by espresso and cocoa. On the palate the fruit is exquisitely ripe and sweet, the blackcurrant and plum flavours melding into a more structured, grippy mid-palate where sinewy, grainy tannins and plenty of extraction coat the mouth. The balance is very good, becoming chewy and savoury into the finish, in a bold, powerful and impressive wine. 93/100. About 24 Euros. A sniff of this immediately brought Amarone/Ripasso to mind, and indeed on researching I see that it is indeed fermented on the sun-dried skins from Ferrucci’s cuvée ‘Domus Caia’ (see below). There are notes of raisins and stewed or baked prunes and plums, with a little violet and spice lift. On the palate this has quite a keen edge, with tart cherry acidity and a lot more zip about it than I thought it might have. It is dense and powerful, though with just 13% alcohol, with firm tannins and plenty of spice and grip. 88/100. Around 10 Euros. Spending about six months in oak tonneaux gives this wine a nicely cedary and pencil-shaving character as well as refined black berry fruit. There’s just a touch of game too, in a subtle but complex nose. On the palate the impression of intelligent restraint and classical Sangiovese elegance structure continues, with a supple tannic edge and plenty of juciy cherry acidity sweeping through the ripe red fruit of the mid-palate. Finish with tang and savoury appeal, a very nicely made wine. 89/100. Price not known. Though the name of this Sangiovese perhaps loses something in the translation, it is a real powerhouse of a wine from vineyards not far from the seaside resort of Rimini. It has a saturated colour and extremely dense, sinewy nose of meat-stock and savoury, olive-tinged black fruit. Intense, tight and concentrated on the palate too, this is a very serious wine at its modest price. The wine spends only a short period in older oak, so the muscular, grippy finish is all fruit and tannin. A real mouthful but noteworthy indeed at the price. 91/100. Around 10 Euros. There is a freshness and cherry-ripe appeal on the nose of this wine, with a touch of something violetty and floral and a little vanilla softness. On the palate it is nicely balanced, with that bittersweet tension between ripe, cherry and bramble fruit and the edgy spice of the tannins and highish acidity. This makes the wine lively and firm on the finish, with a crisp, savoury appeal. 89/100. Around 10 Euros. Dark and vinous, there are notes of cherry and crushed blackberry and blueberry to this wine. On the palate the fruit strikes more sweetly than the nose suggests, with and intense kirsch-like fruitiness before a really dark and liquoricy bittersweet twist begins to grow on the mid-palate. Sinewy and even verging on the austere, but in a good way making this a food-friendly, savoury wine that seems honest and forthright with grippy tannins and good acidity. 89/100. Around 10 Euros. In the hands of the Drei Donà family since the 19th century, this estate has been moved steadily upward in quality under current owner Count Claudio Drei Donà, and this top wine is made from old-vine Sangiovese aged in French oak tonneaux and barrique for 18 months. It has a lovely nose, with dark, cherry, raisin and blackcurrant fruit infused with incense and a touch of tobacco. On the palate the fruit is really very sweet and elegant, a firm, fine tannin structure keeping an edge through the mid-palate and balancing acidity extending the finish. There’s a real vivacity to this wine. 91/100. Appears not to be in the UK. Around 22 Euros. This 100% Sangiovese from Emilia-Romagna is matured in French oak barriques and has a voluptuously smooth aroma, with tobacco and mulled wine spices melding into plum and deep, ripe cherry fruit. On the palate that underpinning of sweet, smoky, chocolaty oak supports very good fruit, with plenty of plush, ripe flavours, but also quite fresh and edgy thanks to brisk acidity and a bit of grippy tannin. There’s a lot of spice and charry toast in the finish, but the fruit and acidity stands up well leading into a long, deliciously balanced finish. 91/100. Around 25 Euros. There is clearly a big influence from new French oak on this wine with plenty of exotic spice, Sandalwood and cedary notes over quite plush, tobacco-infused black fruit. On the palate this is broad-textured and mouth-filling, with a lush weight of black berry fruits and plenty of swirling, smoky, deep and charry notes. The tannins are robust and add to the chewy density. Acidity is a little overpowered by these, but does add a welcome cut and edge to the finish. A big, plush, modern style this, but the quality is very good. 91/100. Around 25 Euros. A wine that has attained the prestigious Tre Bicchieri from Gambero Rosso, this is aged in new barriques. There is rich black fruit on the nose, but also a gamy undertone, with earth and leather, and a cedary edge. The palate is a bittersweet symphony, with liquorice and tart cherry acidity, striking, lean tannins and edgy black fruit combining to be quite linear and sinewy in the mouth. This is similarly confident and modern to the ‘Avi’ above, but retains more savoury bite and juicy structure. 92/100. Around 21 Euros. Reckoned to be amongst the elite of Emilia-Romagna, previous editions of this wine have scored in the 90s with top US critics. This cuvée from winemaker Cristina Geminiani is made in the best years (this is the 10th release since 1985) from 25-year-old Sangiovese. It is immediately rich and ripe, with a touch of Porty lift and density, and sweet, solid black fruit married to savoury oak. On the palate that bloody, gamy density comes through, with the sweet fruit melding into muscular tannin, and the fleshiness of the mid-palate nicely tempered by a juicy, tangy, cherry-skin acidity. Delightful stuff this. 92/100. Around 28 Euros. Cropped low from 40-year-old vines, cuvée Thea is Tre Monti’s best Sangiovese, aged 12 months in new Alliers oak barriques. It has an opulently creamy nose, where tobacco and cigar smoke swirl through dense, glossy black fruits. This is plush, modern and displays plenty of charry oak. On the palate that opulence and layered, lush, velvety impression is reinforced, with masses of spice and cedar to bold, thick, sweet and creamy black fruit. It has some structure, but this is all about immediate gratification, which it certainly achieves. 91/100. Around 21 Euros. There’s no doubting the seriousness of the intent here, with the super-heavy bottle, expensive French oak ageing and, indeed, Tre Bicchieri from Gambero Rosso in 2008. And there is no disappointment in the glass as a soaring nose of Sandalwood and clove, thick, sweet black fruit and swirling, charcoally woodsmoke positively leaps from the glass. On the palate this has the richness of the cuvée Thea from Tre Monti, but adds in a terrific, supple juiciness and slightly wild, animal notes that add layers of interest. It is chocolaty and deep into the finish, with grip and structure. Pretty impressive. 93/100. This IGT is a blend of 85% Sangiovese and Cabernet Sauvignon. There’s a distinctly meaty, bloody character on the nose, with spices and tobacco. On the palate this is a powerfully, almost aggressively tannic wine, with the sweetness of the very ripe, blackcurranty fruit slightly overpowered by spices and liquoricy tannins which just shorten the finish slightly. 86/100. Around 10 Euros. This 100% Sangiovese cuvée has a bold crimson colour and equally bold, creamy and ripe cherry-fruited nose. On the palate it has a medium-bodied but rich texture, with the softness and again creaminess of cherry fruit to the fore, but backed up with nicely bloody, gamy nuances and touches of sweet earth and tobacco. The finish is really quite long, with good acidity and refined tannins honing the edges of the sweet fruit. A lovely little wine this at around 10 Euros. 90/100.